This camera offers a big zoom for a low price. It tends to expose accurately and its flash is powerful. However, image quality is not tops, full-resolution burst is slow, and manual modes are lacking. But if rapid-fire low-res burst and 19 Beauty Fix adjustments make up for it, this ultra-zoom is a good fit. Read more in our Full Conclusion. Olympus continues to build upon their powerful line of SP-series, super-zoom cameras, with their latest addition for 2012 being the SP-820UZ iHS. This is the second model we've seen with iHS designation (the first being the lifeproof TG-1 iHS), which represents the camera's intelligent, high sensitivity, and high speed abilities. These are provided by a 14-megapixel CMOS image sensor mated to their TruePic V Image Processor, which Olympus claims combined allow you to capture high-quality stills in various situations (including low-light), along with full 1080p HD video. Framing your photos and videos is accomplished on a nice, 3.0-inch LCD. While all of the above features are appealing, the spotlight shines upon the SP-820's 40x Ultra-Wide angle lens, which boasts an amazing 22.4 - 896mm equivalent zoom range. 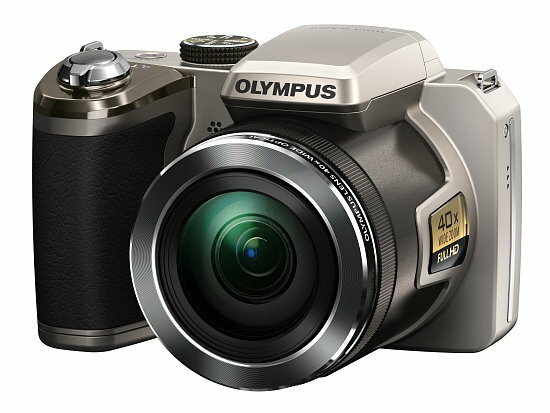 The Olympus Stylus SP-820UZ iHS has a MSRP or $329.99 USD. You can choose from Black or Silver. Click our lowest price button at the top right of this page to see the most current online pricing.